Do you want a system that is almost worry free and keeps your whole house comfortable? The Evolution System is more than likely the system for you: offering a state-of-the-art communication system at its core and delivering high-efficiency performance for total home comfort in any season. This system can detect when it needs maintenance and alert your dealer of potential issues before you know it. The Evolution® Connex™ Control give you more control over temperatures, humidity, indoor air quality, fan speed and your ventilation. 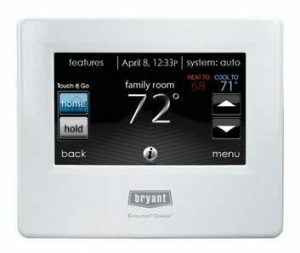 You can connect using wireless access or using the deluxe, full-color tech touch screen to program and manage your customized home settings from zoning to schedules throughout the day or evening. Taking a vacation? No worries, with customized settings you can set it to keep your home comfortable and efficient even if you are not there. The Bryant® Evolution® System air conditioners provide you with lasting quality and service with the system control you want. The Evolution® Connex™ is packed full of intelligent energy-management features to save you money and give you peace of mind. 100-plus years of experience and cutting edge technology coupled with the Whatever It Takes® difference makes Bryant® your air conditioning solution for any budget with three different levels of product lines all for your comfort and peace of mind! Whole-home comfort can be yours today! Give Sanders & Johnson a call for your free quote now.